“Social capital… reflects the community skills that have co-evolved with individual skills. People working together generate webs of social capital”. So say Jessica Lipnack and Jeff Stamps in Virtual Teams. Social capital is built on rich social networks. It is a delicate thing. Social networks are forged from trust and as anyone who has suffered from infidelity in a relationship can tell you, trust builds up over time and but is very easy to destroy. 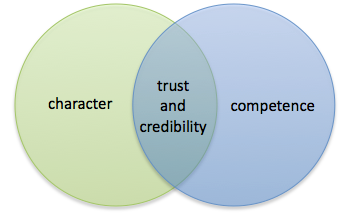 According to Stephen Covey, trust becomes established when individuals demonstrate character and competence. Where these intersect trust and credibility is established. We can easily see the beneficial consequences of trust and the accumulation of social capital when we consider those societies where trust and social capital has been shattered. Many of us can only imagine what it would be like to live in community where there is frequent violence, abuses and threats. In circumstances such as these the dismantling of social capital is accelerated when the state is perpetuating abuses. People generate wealth in dense networks of horizontal relationships in two primary ways because they lower transaction costs [and] increase opportunities for cooperation. A simple example is the knowing a friend will meet you as agreed, although a week has elapsed since the meeting was scheduled. You can probably think of a friend like this – and, by contrast, those that you would always contact to confirm the meeting. The extra workload, even if it is only small as illustrated in this example, reveals an added “transaction cost” to the relationship. Stephen Covey Junior provides another example in The Speed of Trust. A New York street vendor selling hot dogs found long queues dissuaded potential customers. He decided to enable customers to make their own change. This freed him up from dealing with cash and enabled him to provide much quicker service. His customers appreciated being trusted. Now take these small gains and multiply the effect in large organisations (such as businesses) and their multiple stakeholders. The difference between a high trust and low-trust environments is clearly substantial. Better World Books exemplify the development of social capital. They are a social business, motivated to do good. The profits flow, and they disburse much of them by supporting literacy initiatives around the world. According to Kevin Jones Better World Books “is now approaching $60 million in revenues with healthy profits and a compound annual growth rate of 35 percent. It’s donated more than $11 million to nonprofit groups helping to give the gift of literacy. Better World Books stock comes from donations from individuals, educational institutions and libraries. They are sold for a reasonable price to fund the company’s philanthropy. The Good Capital Social Enterprise Expansion Fund (SEEF) invested in Better World Books to aid it through its establishment phase. So we have a company who have a philanthropic supply chain, have staff who are no doubt inspired by the company’s mission, social enterprise investors, customers who buy into the mission and an increasing cohort of beneficiaries of literacy programmes. This is a potent recipe to build social capital that extends well beyond the boundaries of the company. As Professor Muhammad Yunus says, every problem can be solved with a social business. The challenge for more conventional companies is how to use this dynamic and learn from its masterclass of engagement and social capital accumulation. Here is a YouTube video of Better World Books. Note that the figures presented are four years out of date (reinforcing their incredible growth). This entry was posted in Community building, Sustainability and tagged Better World Books, Lipnack and Stamps, social business, social capital, trust by Peter Bruce-iri. Bookmark the permalink.